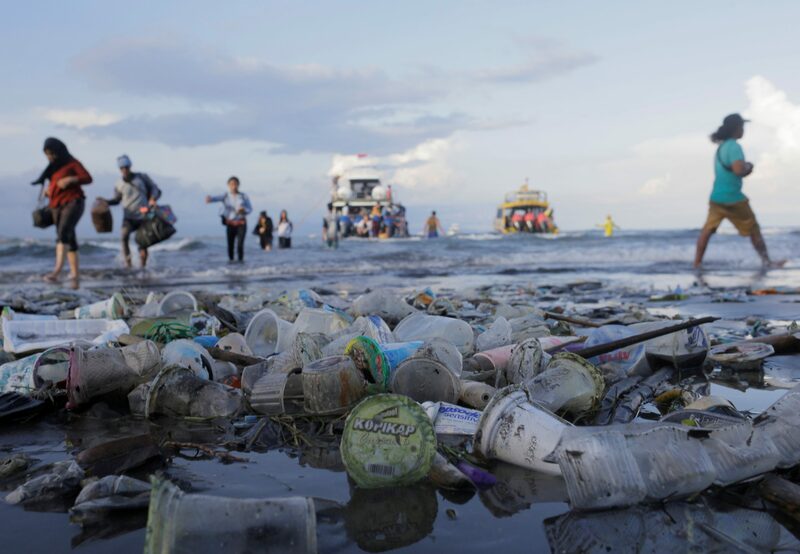 Tourists and local residents disembark a boat coming from nearby Nusa Penida island as plastic trash pollutes the beach in Sanur, Denpasar, Bali, Indonesia April 10, 2018. Norway’s $1 trillion sovereign wealth fund, the world’s biggest, said on Sept. 5 it wants companies it invests in to be transparent about how they manage ocean degradation, in particular by tracking risks such as pollution and overfishing. The fund said its new guidelines could affect investments with a combined value of $56.5 billion euros, or 8 percent of the fund’s global equities portfolio, in sectors including shipping, plastic making, fishing, packaging, among others. Norway’s sovereign wealth fund invests revenues it derives from Norway’s oil and gas production into about 9,000 companies across 72 countries. The fund has since 2012 issued so-called expectations documents requesting companies to disclose their strategies in areas such as human rights, water management, tax transparency, and others, which it sees as posing long-term investment risks to its portfolio. Companies that fail to address these risks can be dropped from the fund’s investment list. The fund and a government-appointed committee are at odds over whether to continue to invest in oil and gas companies, with a decision expected this autumn.